Everything in fashion comes around again and right now, the sleeves on the wedding dress worn by Anne, Princess Royal, for her first marriage on November 14th 1973 are so hot they need a bucket of ice. 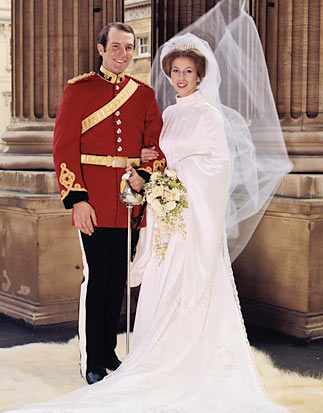 Statement and then some, they are the most famous feature of this elegant gown which was wowed over by millions as the only daughter of the Queen and the Duke of Edinburgh said 'I do' on November 14th 1973 to Captain Mark Phillips. The marriage ended in 1992 but the couple remain friends and the dress remains a royal icon. Part of its magic comes from the fact that for its time, it was modern and on the money. It was about as contemporary as royal wedding dresses got then which is why it screams seventies from every inch of its silky sleeves and skirt. That's perhaps a surprise when you consider that this gown was inspired by the Tudor era. It was designed by Maureen Baker from the company, Susan Small, and Princess Anne is said to have had a major input into the pure white gown. The high necked bodice has an air of Elizabeth I about it, though thankfully Anne skipped the full ruff effect and settled for some sparkles and pearls instead. The embellishments from the collar work down into the lines that mark out the top of the dress. The bodice is very fitted while the skirt fans out into a gentle effect of fullness. But it's the sleeves that separate this royal wedding dress from the rest. You can't miss them. There's statement and then there's full on, in your face, did someone say sleeves. The overlayer of the cuffs is cut into a long, draping medieval inspired trumpet shape and then underneath is a chiffon puff just to highlight that this dress is sleeve centred. It works, partly because the rest of the dress is so simple. Yes, there is embroidery on the train (this is a Windsor wedding, that's compulsory) but it's so subtle that the creative cut and chic shaping take centre stage with the sleeves adding the box office moment all royal wedding gowns need. OK, they also need a train. Anne kept it relatively simple here with around seven feet of silk following her up the aisle and her veil is a gentle and rather delicate affair that covers the train to add the air of romance. All in all, this is a dress that has more than stood the test of time. The most unadorned of all the gowns worn at the Windsor weddings of the modern era, its simple appearance belies a multitude of clever designs that came together in a dress to remember. Over forty years on, Anne's royal wedding gown remains a classic of modern times. Harry and Meghan: where will they marry?